Want to share your research with the world? Or are you finally ready to publish that elusive novel? For staff, faculty, and students at UC Berkeley, publishing a book just became easier. UC Berkeley has added PressbooksEDU to its suite of publishing platforms that scholars can use to develop and release their works. Anyone with an @berkeley.edu email address can use the tool to write, edit, and publish digital books that are accessible by people across the globe. This makes UC Berkeley the first university to make PressbooksEDU available universitywide. A new site, UC Berkeley Open Books, will feature openly licensed books by UC Berkeley authors. PressbooksEDU is the latest publishing platform supported by the Library to help researchers bring their digital scholarship to life. Other platforms include Share LaTeX, Overleaf, and Scalar, and even more, such as Editoria, are on the way. PressbooksEDU is a terrific and critical addition to this suite of offerings, said Maria Gould, the Library’s scholarly communication and copyright librarian, who is overseeing the implementation of Pressbooks. “With PressbooksEDU, UC Berkeley scholars can develop digital projects or scholarship of any length,” Gould said, “and have those projects hosted online as a web book, and export them into a variety of digital formats,” including EPUB, MOBI, PDF, XML, and others. PressbooksEDU is simple to use. Because it is based on WordPress open-source blogging software, it is easy and infinitely flexible for a variety of digital projects, from creating a chapter to writing a novel or textbook — and everything in between. Quickly becoming the preferred tool for educators and writers publishing open books and other content, PressbooksEDU offers a number of features to support open access and accessibility. It’s easy. No design or developer skills required. Immediate and continuous publishing. Publish in minutes, and make changes or edits easily as you go. You control the content, and can revise and update it at any time. Accessibility. The platform is designed with an emphasis on accessibility. Pressbooks is committed to making its code and user interface meet WCAG 2.0 (level AA) web accessibility guidelines. It is also developing more tools to help authors maximize the accessibility of published works. Collaboration. Give a co-author access to your project, and use Hypothes.is to add or enable public annotations. Flexible licensing. License your work with any number of Creative Commons options. You can use the same license for the whole work, or apply different licenses for different chapters or sections. Free! Anyone with an @berkeley.edu can create a book or project at no cost — and make it free for the world to read. What makes PressbooksEDU particularly compelling is that it can be used to create open textbooks, sometimes called open educational resources or OERs. Textbook prices have risen 88 percent in the past decade, as detailed in a 2016 Bureau of Labor Statistics report. With UC Berkeley undergrads expected to pay at least $850 (a low estimate) on books and materials each academic year, students are financially encumbered to obtain required readings. One way to alleviate financial burden for students is by offering them OERs, which are entirely free for anyone to access, read, and download, and are typically licensed for reuse to encourage further downstream adaptation and collaboration. “Openly licensed educational resources created using Pressbooks can reduce the significant financial burden to students of purchasing course materials,” said Rachael Samberg, who leads the Office of Scholarly Communication Services, which has been supporting campus OER efforts. 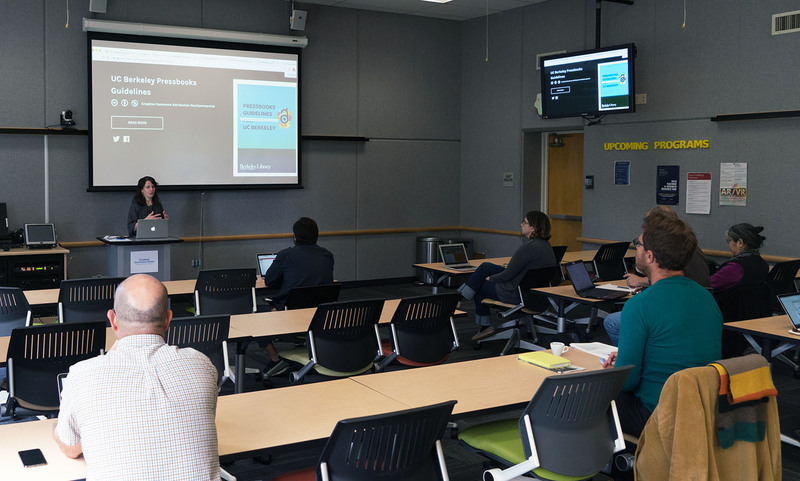 At the same time, UC Berkeley faculty and instructors creating OERs through Pressbooks generate new, world-class scholarly resources that can be used anywhere. “These globally accessible resources can help build further impact for the works of UC Berkeley authors, and add transformative value to their scholarship,” Samberg said. Pressbooks’ founder, Hugh McGuire, is committed both through Pressbooks and his Rebus Foundation to supporting affordable education through open publishing. “We’re excited to see institutions like UC Berkeley adopting PressbooksEDU to support publishing initiatives, and we look forward to helping support the Berkeley community,” McGuire said. Want to get started on your own digital book or project? Head to openbooks.berkeley.edu, and click Sign Up. Before you let your creative juices run wild, we recommend a pit stop at our Berkeley Pressbooks Guidelines (which we’ve created using Pressbooks). The guidelines explain all the basic ins and outs of how to use Pressbooks to create, edit, and customize your book, as well as important policy considerations when doing so. For instance, you should avoid uploading content that infringes copyright, privacy, or other rights; there are ways to format your work that make it more accessible for readers who use assistive technology; and more. Don’t worry — everything you should know before starting is covered in our Berkeley Pressbooks Guidelines, and you can contact us anytime. If you want to explore further, join us at our Pressbooks workshop on April 26, and you’ll come away with a project already started. Or if you have material you want to publish online but aren’t sure whether Pressbooks is the right tool to use, let us know — we are happy to consult about which Library-supported platform meets your needs. When you publish a book on Pressbooks, it will be available online and in downloadable formats to share however you’d like. If you want even more exposure for your work, you can apply a Creative Commons license to promote collaboration and innovation. (These licenses inform other users about the scope of how you’re authorizing your work to be used, and you can read more about how they work on the Library’s Scholarly Communication website.) For maximum visibility, deposit a copy of your book in eScholarship, the UC system’s repository, and submit a request to get your project featured on UC Berkeley Open Books. Please contact schol-comm@berkeley.edu with any questions.